Homelessness rose just a bit this year in the U.S. Here’s how Seattle compares. Despite millions being spent to help, Seattle's homelessness went up 4 percent in 2018. 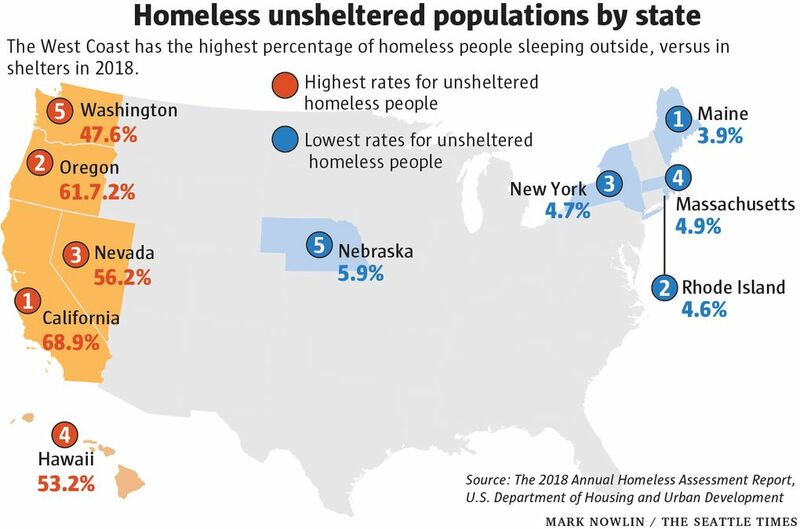 Washington state's number of people living homeless was up 5.6 percent — more than any state, save Massachusetts, New York and Texas. Homelessness in the U.S. has remained almost flat in 2018, highlighting the magnitude of the problem in Seattle, where the number of homeless people swelled by more than 10 times the national average, according to new federal data. 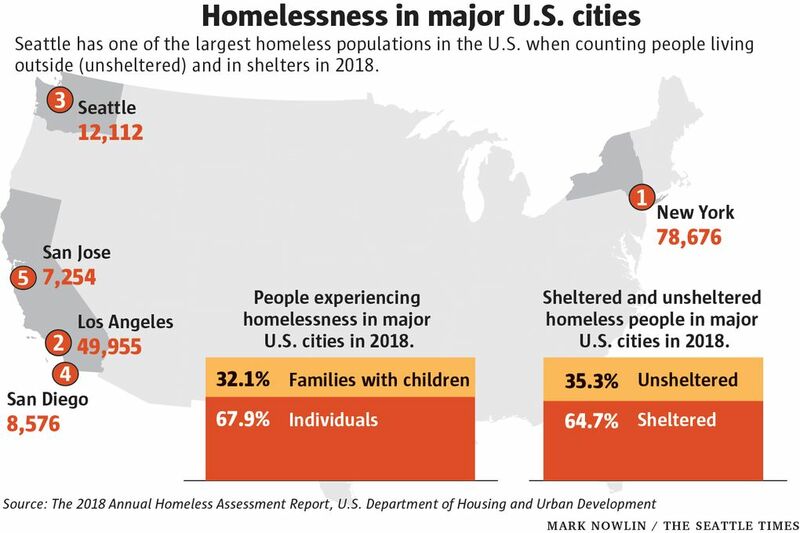 Homelessness rose 0.3 percent nationally this year, according to a report released Monday by the U.S. Department of Housing and Urban Development. The agency announced the results of counts of homeless people from one night in January in more than 3,000 cities and counties, a study that’s been conducted annually for more than a decade. Seattle remained — as it has since 2015 — third in the nation when it comes to the sheer number of homeless people. Seattle stands behind L.A. County and New York City, both of which saw decreases this year in their homeless populations. Seattle’s homelessness, meanwhile, went up 4 percent. Nationally, the rise in homelessness mostly came from small cities and suburbs, like Vallejo, California, Pasco County, Florida, and Clackamas County, Oregon. In a state-by-state comparison, Washington has also seen its homeless population grow by 5.6 percent. That’s more than any state, save Massachusetts, New York and Texas. In Seattle, which is now spending around $90 million on fighting homelessness, local politicians have asked for more investment from the federal government to build affordable housing. Earlier this year, the consulting firm McKinsey & Company estimated that King County needs another 14,000 affordable units for people experiencing homelessness and that annual spending would need to double to $410 million to adequately address the crisis. According to a draft action report from the county’s Regional Affordable Housing Task Force, the county will need more than 100,000 new housing units affordable to the region’s lowest-income people by the year 2040. However, the rate of increase in homelessness nationally has slowed down compared with a year earlier, when it rose at 0.7 percent, according to HUD. The 2017 report marked the first time homelessness nationwide rose since the Great Recession. That could show that efforts to address homelessness by West Coast cities, including Seattle, may be beginning to work. Barbara Poppe, a former director of the U.S. Interagency Council on Homelessness, who produced a report in 2016 on how Seattle could fix homelessness, recently told The Seattle Times the city has made progress with funding its shelters and service providers. But progress on addressing the affordable- and rental-housing crisis was “not to the scale of what the needs were,” she said. 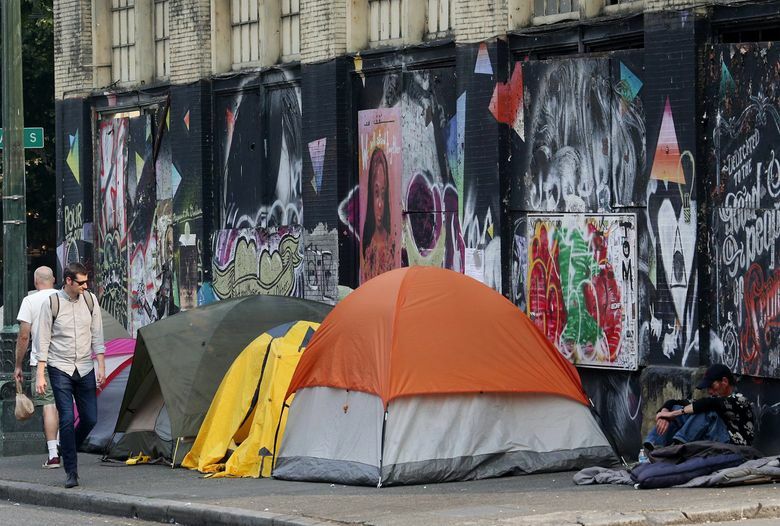 Still, the HUD report is an imperfect count because some cities, like San Francisco, didn’t count their homeless population in 2018. It’s possible that the downward trend is only a reflection of incomplete data. 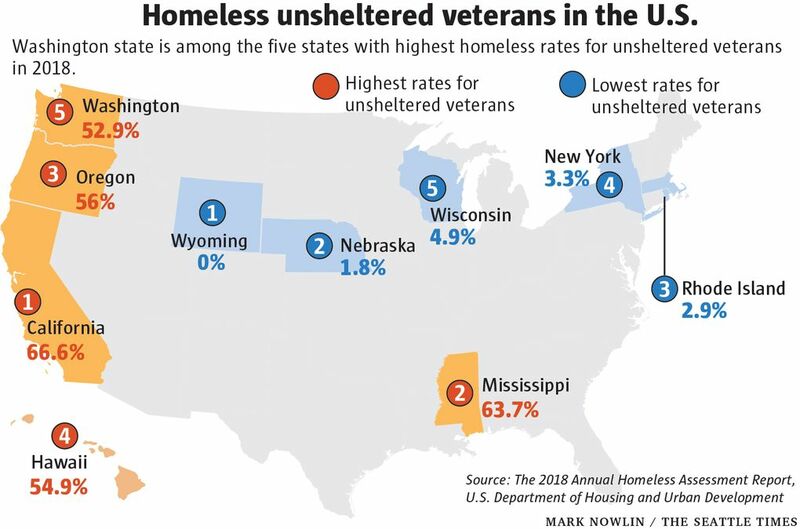 In a call with reporters on Monday, HUD Secretary Ben Carson pointed to the upsides: The number of homeless veterans fell by 5.4 percent, and homelessness among families with children is down 2.7 percent. But the report also shows that the number of homeless people sleeping outside, as opposed to people who sleep in shelters, was up by 2.3 percent. Carson didn’t commit to spending more federal dollars for housing, but instead pointed to local funding efforts, like L.A. County’s $1.2 billion housing bond. Homelessness in L.A. County fell 3 percent this year. “Our state and local partners are increasingly focused on finding lasting solutions to homelessness, even as they struggle against the headwinds of rising rents,” Carson said. The New York Times reported earlier this year that Carson privately told aides he sees the shortage of affordable housing as a local problem. Seattle Times reporter Vianna Davila contributed to this report.